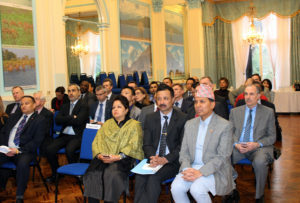 The Embassy of Nepal in London hosted a presentation titled ‘Integration and rehabilitation of former Maoist combatants in Nepal’ on Thursday 26th January 2017 at the Nepalese Embassy. The event commenced with an opening address by HE Dr Dugar Bahadur Subedi, Ambassador of Nepal. 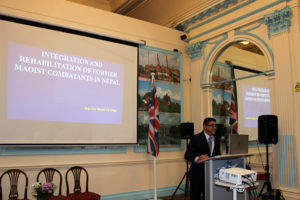 The presentation was jointly delivered by Nepal Army representatives: Major General Sharad Giri, General Officer Commanding of the Valley Division, and Brigadier General Shashi CB Singh who is a Royal Military Academy Sandhurst alumnus. The event concluded with a closing remark by Dr Arzu Rana Deuba who is an honourable Member of Parliament of Nepal and a former councillor of the International Union for Conservation of Nature (IUCN), currently in the UK in her private capacity. 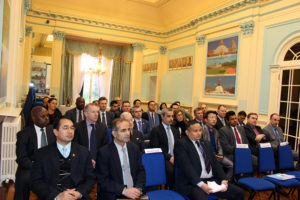 Present on the occasion were members of the diplomatic corps in the UK, UK’s foreign ministry representative, and Colonel Brigade of Gurkhas, Colonel James Robinson. 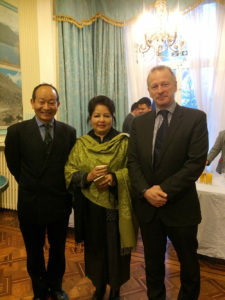 Colonel Robinson took the opportunity to talk to both Dr Deuba and the Ambassador, and was accompanied by his Deputy Chief of Staff, Major Surya Rai.